After months of steep competition, NC State Dining is proud to announce Sous Chef Stephen (Steve) Toaso and his blended burger have been selected as winners of the 2017 James Beard Foundation’s Blended Burger Project: Campus Edition. The Blended Burger Project asked university and college chefs to blend mushrooms and meat to create a more sustainable and nutritious burger. 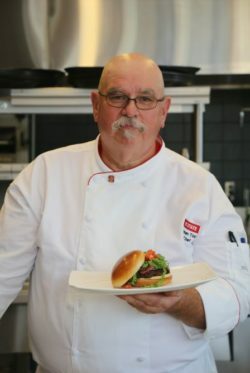 Chef Steve cooked up his own “Carolina-Style BBQ Blended Burger” recipe, mixing mushroom and beef to create a savory burger with a BBQ twist. The burger was served at 1887 Bistro in Talley Student Union and submitted to the Blended Burger Project website, where voting took place over a three-month period. Though it faced fierce competition from universities in the 15,000+ campus enrollment category, NC State’s blended burger came out on top as one of six winners in the competition. Chef Steve will be traveling to New York City to cook at the distinguished James Beard House as part of the grand prize. To learn more about the contest, visit https://www.jamesbeard.org/bbpcampus. NC State Dining is a service of Campus Enterprises, the lead division for retail and hospitality on campus. For more information on NC State Dining, contact Lindsay Hester at lphester@ncsu.edu.